There are a number of reasons why someone may want to purchase a hidden spy camera. Some people want a nanny cam to keep track of their children’s babysitter or nanny. Some people want a way to check in on their pets when they aren’t at home. Then there are some who want a discreet camera to guard against intruders. This guide will cover some of the main considerations when selecting your hidden camera. We will explain how we made our selections, frequently asked questions about security cameras, and what reviewers say. Finally, we will provide reviews of our top six selections. Before you begin your search, you may want to skip ahead to the FAQ section of this Photophique guide. That will help you to review the laws surrounding spy cameras to make sure your camera use is legal and allowed. Once you’ve done that, we hope you’ll use this guide to get you one step closer to becoming a secret agent. What Makes this Spy Camera Our Top Pick? This camera is a great option, as is much more discreet than many other hidden cameras. The dark glass front enables the lens to record video without it being detectable. Even if people pick up the clock and look for a lens, they won’t find it as it is entirely camouflaged. The design is stylish and functional. It can be set to work with a Wi-Fi network for live-streaming. You can also use it as a DVR to record video to watch later. Users can set it to motion detection to avoid hours of useless footage. Or, they can keep it on full video mode if they prefer. People find this spy camera to be particularly easy to use. The super night vision enables the camera to see 8 meters ahead in the dark. The Wi-Fi transmission feature is reliable and only has minor lag. The quality of the video and components in the clock itself are both high. The design makes it particularly good to place in your child’s bedroom or playroom. That can enable you to keep an eye on them when you’re in the kitchen and ensure they are safe, if you don’t want a typical monitor. This can be a great way to go if you have a nanny that you want to keep an eye on. Reviewers praised the sleek, discreet design and smooth live video functionality, particularly at night when a pitch black room looks like daylight in black and white. The package comes with a rechargeable battery and an SD card. The camera is easy to set up with your phone. The manual is also easy to read, and further functions like Gmail alerts can be found online. One complaint was that the SD card isn’t very large. So if you choose to record onto hard storage you may need to buy a larger memory card. Some users also had difficulty connecting the spy camera to their Wi-Fi network. They found that it disconnected every once in a while. Reviewers liked that the camera comes with a three-month, no-questions-asked warranty. That way, you can send it back if yours is defective or you simply don’t like it as much as you hoped. It also records 720 pixel, date-stamped footage so you know when you recorded the video. If you plan on using it in your child’s playroom or bedroom, the package of stickers to decorate the clock are a particularly nice touch. The clock design, while sleek, does mean that you need to place it somewhere that makes sense. That could be a desk, side table or nightstand. If you want wider footage, you need a spy camera that you can discreetly mount higher or hide in your smoke detector. It would look weird to mount a camera to the ceiling of your room. It comes with a rechargeable battery. So you have to remember to recharge the battery every once in a while. Also, if you do decide to record footage instead of watching a live stream then you need to remember to retrieve the memory card and wipe it almost daily. The manual is clear. However, it doesn’t have all of the information you need. So you’ll have to Google additional features to learn how to activate them. This isn’t a huge issue, however. The information is readily available online. What Makes this Camera Special? This camera is what many people think of when they think spy camera. The camera itself is about the size of the tip of your finger. It connects to a receiver that can be placed separately. It is designed to look like a Wi-Fi router. The small, discreet design means you can place it discreetly on a bookshelf or design a small box or clock to hide the camera in. The spy camera itself records 720P video quality at 30 frames per second. It live streams from anywhere via the accompanying app. You can also configure the mobile alerts and sensitivities based on your preferences. Even more importantly, you can choose to record video onto an SD card. You can also record it directly to your NVR security surveillance system, a PC folder or a NAS network storage device. There is an audio port if you want to plug in a microphone. However, remember the legality challenges of recording audio if you want to use this function. Overall, the camera is simply designed, secure and reliable for a long time to come. The weatherproofing even means it will be reliable for a long time outside. This camera is reliable and high-quality for a reasonable price tag. It offers far more customization than any of the other cameras on this list. This is definitely a spy camera for the more technologically inclined, however. Reviewers who wanted something they could plug in and walk away from found it to be difficult to install and set up. One of the main elements reviewers praised about this camera was the high-quality video it captured. 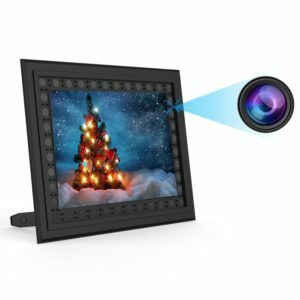 It provides crystal clear images that record onto storage and stream to smart phones and tablets. 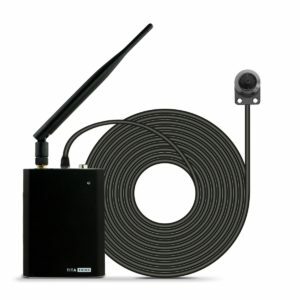 The wireless router and the camera connect with a cable. But connecting the two isn’t difficult since you receive 20 feet of black cabling. Reviewers were particularly fond of this camera for surveilling a small business. That is because it is much more discreet than most spy cameras intended for such purposes. The high-quality footage gives a higher chance of identifying thieves and other unsavory customers should something happen. You have to be able and willing to create a custom setup for this camera. That potentially includes designing a housing for it if you want it to be more hidden than taping it up a corner of the wall to the ceiling. The camera also comes with audio capability. That could get you in trouble if you don’t check the legality of recording audio in your state closely enough before using this feature. You also have to have enough technical know-how to choose a method of recording your video since there are so many options available. The customizations can be a blessing if you want to be able to choose how your spy camera functions. They can also be a curse if you simply want to be able to plug it in and have it work. The design is perhaps what makes this spy camera most unique, with the casing looking and functioning like a normal picture frame. This enables you to incorporate it with your décor seamlessly. It makes it a great choice for a nanny cam. The lens is located along the inner border of the frame. However, the circle design along the frame makes it almost impossible to pick out if you don’t know it’s there. The night vision Black LED functionality is invisible. It operates without a flashing light like many other options do. It can capture up to 25 feet in pitch black dark. That allows you to keep an eye on your home 24 hours a day. The motion detection technology also means you will save space and battery life. That way, you won’t have to sift through hours of useless footage. Another unique feature of this camera is the super long standby functionality. The camera has the ability to sit in standby for up to two years before it can begin filming without needing to be charged first. This is a great feature if you go on a long trip or sabbatical. It is also helpful if you want to put it in a vacation house that is rarely used. The video is particularly high-quality. Each clip has a date and time stamp so you can easily keep track of when your footage was recorded. Viewing the footage is easy since you simply remove the SD card and download files on the computer. The spy camera also automatically overwrites the oldest files if you forget to clear the storage. That means you will never miss footage if you forget to clear the memory card. Reviewers liked that, unlike several other camera choices, this one doesn’t have any blinking lights or constant lights to operate. That makes it truly hidden and hard to detect. The spy camera can be set to record continuously for 30 hours. It can also be set to record only when there is motion to activate the camera. Reviewers liked the discreet, functional design. They noted that it worked just as well as nighttime security or a daytime nanny cam to keep an eye on your kids and their caretaker while you’re at work. The price is also reasonable for the uniqueness and the high functionality of this spy camera. That makes it a high-value purchase. The spy camera is hidden in a photo frame. So it has to be placed on a table or mounted on the wall at a height that doesn’t call attention to it. This means you won’t get quite the coverage that you would if you had a fisheye camera that mounted to the ceiling. The lack of streaming is also a bummer. You can’t monitor the footage if you do decide to use it at a vacation home to check for robbers. On the plus side, if you arrive or hear from police that your house was broken into, you will almost certainly get it on camera. The combination of motion detection filming and the fact that the camera rewrites older files if the memory fills up means you are unlikely to miss out on important footage. The night vision is particularly strong. However, you may want to turn the camera off if you want to use it as a daytime nanny cam and you have pets that are more active at night and would use up the memory and battery capacity of the camera. Overall, this spy camera is a stylish and robust option for outdoor surveillance. The camera is disguised by the light design. So people are unlikely to find it unless they know it’s there or are specifically looking for one. The alarm functionality and two-way intercom makes it effective even if someone were to cover the camera. The power supply needs to be plugged in. That allows for continuous use without the need to recharge a battery. The power supply is energy-efficient, so it doesn’t bump up your electricity bill. Video can be viewed via live streaming or recorded for up to 2 and a half hours of motion detection footage. You can also upgrade the memory storage with a monthly subscription plan. The camera is compatible with Amazon’s Alexa system. That allows you to control your intercom and security lights with your voice. The intercom system is also great whether you are home or not. It enables you to communicate with visitors or package delivery people. There are no batteries or memory cards to replace. So you don’t have to remember to check them. You also won’t need to alert people watching that you are checking a spy camera daily or weekly. 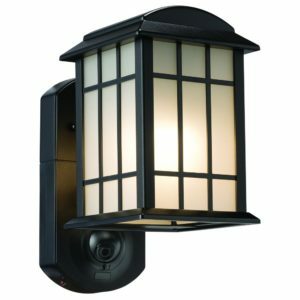 Overall, reviewers thought this was a great outdoor camera for monitoring your entryway. They also thought it was great for ensuring your babysitter is keeping an eye on your kids when they are playing in the front yard. There is a higher risk of harm or kidnapping in the yard. So it is nice to know you can capture any potential mishaps on film with a time and date stamp. The biggest criticism is the limited recorded video capacity and the need to pay a monthly fee to expand that capacity. A majority of other spy cameras don’t have this need. With those, you can simply load a larger memory card if you want to record more footage. Overall, the design is stylish and attractive. Reviewers found the unit to be easy to use. They liked that there were no memory cards or batteries to be checked and swapped. The biggest consideration is the fact that a monthly subscription fee is necessary to expand the video memory capacity. This is a headache. It means that you will definitely have to pay a monthly fee if you want to have sufficient video & image storage. The alarm, two-way intercom and smart light functionality all go a long way toward making up for this fact. That is because you essentially get four pieces of technology. The majority of other cameras only offer one. The second consideration is that this spy camera is more disguised than hidden. The camera is visible beneath the light. If people look at it they may notice that it is there. It is part of the light unit though. So most people would look past it and not study the design. This camera may not have the advanced functionality and gadgets that other spy cameras have. However, it is an affordable and reliable piece of technology. It is straightforward and easy to install. 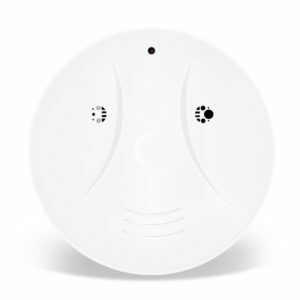 The smoke detector design makes it discreet and difficult to detect as a hidden camera. Since it mounts to the ceiling, it is a great option for getting clear, wide-angle footage of your home. People are unlikely to pick it up or move it. The motion detection technology enables you to only capture footage where there is motion in the room. That way, you don’t have to sort through hours of blank footage that holds no value. You can also use the remote control to turn it on if you are in the house with the camera. The footage that is recorded is 1080-pixel, high-def video. 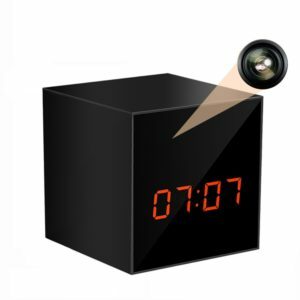 The spy camera can capture between eight and ten hours of video. This isn’t enough if it is continuously operating. It can last for several days or a week if it only captures footage when there is motion to trigger the camera to turn on. The PC-synced time stamp also enables you to keep track of when the footage was captured. The biggest element that viewers praised about this spy camera is the fact that it is one of the most affordable models available. It has a simple yet reliable design. Reviewers praised this camera as a great option for kids who stay home with a babysitter or nanny. They particularly liked how easy it was to install. The spy camera comes with an 8 GB memory card. However, you can switch the card and expand the capacity up to 32 GB. The camera is also able to take photos in addition to video. You can record for up to 18 hours if you choose to upgrade the memory card. The camera is easy to connect to a computer with the USB cable. It charges easily, as well. Reviewers liked that the camera comes with a rechargeable battery. That way, you don’t have to continually purchase new batteries. Finally, it comes with a one-year warranty and technical support for the lifetime of the device. The design can be nice and discreet. However, since it is a smoke detector, this spy camera has to be mounted to the ceiling. This is sufficient for most people’s purposes. But you should also make sure it looks similar enough to your other smoke detectors that people won’t think it looks out of place. The remote control is a nice added feature. However, you have to be within 15 meters in order to use it. This can be sufficient. But it is also less discreet than simply relying on the motion detection video recording. There isn’t live streaming. So you can’t monitor your nanny with your kids throughout the day. You have to remember to view and wipe the memory card periodically. You also have to remember to charge the battery. This one doesn’t operate with a plug-in power outlet. The design is sleek and attractive and is perhaps the easiest camera to install since it screws into any ceiling light. 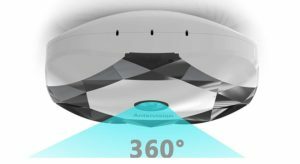 Perhaps the best feature, however, is the 360° filming angle, since the fisheye allows you to capture footage of the entire room without any blind spots. The two-way audio connection also allows you to talk to your pets if you are away on a trip, communicate with your kids if you are in another room or, worst case scenario, alert a burglar to the fact that you know they are in your house. This unit draws power from the light socket, meaning you don’t have to worry about replacing batteries, and has night vision and live streaming. These features all make it particularly attractive if you have pets that you want to check in on when you are away. The design is sleek and stylish, and since it looks like a light bulb, it is hard to detect. If someone is looking directly at the light they may see the lens, but the design is relatively discreet. Users generally reviewed this spy camera well, particularly for its easy installation, fisheye lens and intercom capabilities. The motion detection allows you to only capture relevant footage, so you don’t have to sift through hours of videos, and the night vision capability means it functions just as well at night as during the daytime. One downside is that you need a ceiling-mounted light to install the camera, so be sure to double check that you have one that you don’t need to use for illumination before you place your order. Reviewers didn’t like that that the alert function only worked with an SDMicro card, not a normal SD card. This isn’t a huge problem, but the manual should note this fact. Reviewers were also skeptical of the fact that the camera only works if you use the manufacturer’s server, meaning you have to trust the security company they use. The motion detection feature causes a light to blink when the camera detection movement and begins filming, alerting people each time they are being recorded. If you don’t mind this, however, the spy camera takes clear images and video and is easy to set up and use. You also, again, have to have a light socket in your ceiling to use the camera, meaning you will be down one light and the camera is highly visible all the time. This isn’t a problem if you rely on floor lamps for light more often than ceiling lights, but definitely-double check to be sure you have a free socket first. Also, make sure you research the company to be sure you are comfortable relying on their server and security. You cannot use it on your own server, so if that makes you uncomfortable then we recommend going with a different option. How Hidden Should Your Camera Be? Whether you want a hidden spy camera for home security or to monitor your children’s nanny or baby sitter, there are a number of considerations to take into account. If you’re looking for the perfect hidden spy camera, here are a few of the features we are going to go over in this guide. While there isn’t one perfect hidden camera, different cameras are perfect for different needs. Let’s take a look at the above features so you can select the best camera for your situation. While a majority of hidden cameras released in the last several years are Mac-compatible, in the early years they were only compatible with PC computers. If you don’t have a Mac, this is an easy step since virtually all cameras should be compatible with your computer or phone. If you do have a Mac or iPhone, double-check to see if the camera you are thinking of purchasing will work with your devices. This is only a consideration if you are considering a spy camera with live streaming capabilities. While you obviously want your hidden camera to blend in, there are different levels of hidden. Some are as small as the head of a pen, while others are disguised to look like rocks or teddy bears or clocks. Some even look like normal cameras but are discreet enough to hide. Which you choose depends on your needs. If you need an outdoor hidden camera to keep an eye on intruders or catch the neighborhood cat that’s been peeing on your flower bed, a rock cam would be an excellent choice. The same camera would be much less discreet and more than a little weird inside your house. If you want to keep an eye on your nanny or babysitter, a wireless nanny cam that is visible for full disclosure may be a great option, or you could easily get one that is the size of a pen head to conceal on a clock face. If you are a journalist and want an easy way to preserve evidence, an actual pen with a camera in the top can be a great tool. The cameras that are easiest to use and tend to be the cheapest are self-recording. This means the entire unite is contained, and footage records onto an internal drive or a removable memory card. Once you want to review your footage, you’ll have to connect the spy camera to the computer or retrieve the memory card to watch the videos on your computer. These can be a great option if you are in a situation where you don’t need 24/7 hour access to the footage you are recording, like if you want to record your babysitter with your kids but you feel confident enough that you can review the video after they leave. These are also great for outdoor cameras since you can get a unit that is entirely self-contained and runs on battery power, like the fake rock. The other option is to get a Wi-Fi streaming hidden camera, which enables you to watch live footage as it is being recorded on the internet or even on your phone. These cameras are definitely more difficult to set up and require an internet connection to stream. They also tend to be more expensive, but if you want to be able to check in on your pets while you’re not at home or monitor safety concerns, this connection is necessary. There are benefits to having an entirely self-contained spy camera that runs on batteries and to having an AC-powered hidden camera that needs to be hardwired into a power source. Battery-powered hidden cameras are portable and can be set anywhere and relied on to work well as long as they store video on internal memory drives or cards. The main consideration on these is the battery life, with some cameras ranging from several hours to a full year. AC-powered hidden cameras are more restrictive since they have to be plugged in. If you are going to use your camera far from a power outlet, this is not a good option. If that isn’t an issue, you have the benefit of knowing your camera will run until you unplug it. In general, we tried to select spy cameras that were a great deal for the price, were reliable over an extended period of time, and were easy enough for most people to use. Let’s take a closer look at how we made our selection. When you’re dealing with technology, it’s really easy to find expensive equipment with a lot of features that you are unlikely to ever use. The sweet spot is finding high-quality technology with necessary and convenient features that is reasonably priced. Generally, you should feel like you’re getting a steal, but not so much so that it’s likely the spy camera is going to be a dud. We’re not all James Bond, meaning we don’t all have the money of an entire government funding our technology needs. We tried to select cameras that were priced reasonably enough that normal people could afford to purchase them. That being said, if you are James Bond, we’d love your feedback. This means something different depending on the situation in which you want to use your camera. If it is outside, it needs to be sturdy and weatherproof enough to last in any condition for a reasonable length of time. If your spy camera is inside, the technology needs to be reliable enough to continue functioning for long enough to justify the price, and the camera itself needs to function silently so that your hidden camera stays hidden. Whether your camera streams wirelessly or stores videos on an internal memory card or drive, you need to ensure it has sufficient memory capacity to fit your needs. For instance, if you want to use it to monitor your pets while you are on a two-week vacation, it needs to be able to at least store two weeks of continuous video footage. Camera capacity ranges widely, so we tried to select spy cameras that had enough memory capacity to be useful in a variety of situations. Generally, if you aren’t going to be home to wipe the memory every day, try to avoid a camera that can only hold a day or less of footage. If you forget to clear the memory it will have to stop recording. Once again, we aren’t all James Bond, so we don’t all have a seemingly God-given talent for pushing buttons and getting amazing, instant photo results. While wireless spy cameras certainly take more know-how to set up, we tried to make sure all six cameras on this list were sufficiently self-explanatory or simple to use once they were set up. You shouldn’t need an electrical engineering degree to get a hidden camera working. Are hidden cameras legal to use? 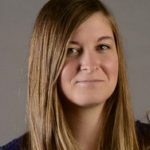 Is it legal to record audio with my video footage? How do I find a hidden camera in my house? Can video footage be used in court if I do catch a crime being committed? Can hidden cameras operate in most temperatures? One major concern in selecting a hidden spy camera is the legality of using it, and since many people do abuse this technology either intentionally or by accident, it’s a good idea to understand hidden camera laws before you purchase and install one. In general, it is legal to record surveillance video footage by way of a hidden camera in your own home in the United States without the permission of the person you are recording. There are two key things to remember here, the first being that this only applies in your home, and the second being that this only applies to video and not audio. Make sure you double-check the laws in your state or speak to an attorney before installing one just to be on the safe side, though. Even though it is legal to record in your own home, it is illegal in most states to record video in an area where people have a reasonable expectation of privacy, such as a bathroom or a bedroom if people live with you or are staying overnight. It is also illegal to record video or audio with the intentional purpose of blackmailing someone or using it for some other malicious purpose. Most states also allow video surveillance in public places such as inside restaurants or in parks as long as reasonable expectations of privacy are met. An example of surveillance locations that would be illegal would be in public restrooms, hotel rooms, changing rooms and other areas where privacy is standard. While laws haven’t been set on the federal or state level regarding spy cameras in the workplace, it is generally considered acceptable for business owners to install hidden cameras in their businesses. The presence of these cameras don’t have to legally be disclosed unless there is a union guideline in place stating that they do. While the laws on recording video are pretty lax, the same is not true for audio. Hidden camera laws are still pretty hazy. However, a majority of states require at least one party in a conversation to consent to audio recording before they can record a conversation either on the phone or in person. There are ten states, including California, Florida and Illinois, that require both parties in a conversation to consent before they can record a conversation, so make sure you double-check before you record audio. If you can naturally overhear a conversation in a public place and pick it up on a recording, that is generally deemed fine, but it is illegal to covertly record audio whether the recording device is hidden in a phone or somewhere in a home, office, shop or elsewhere. Don’t assume that you’ll be fine simply because you are planning on surveilling your own home. Make sure you double-check the laws for your state before purchasing and installing anything. You don’t want to be in a situation where you catch your nanny slacking on the job but you can’t confront them because they could sue you for illegally recording them in some manner. Some of you may have found this article because you suspect someone is using a hidden camera to monitor you in some manner, so here are some quick tips to find a hidden spy camera if you suspect one is in your car, home or office. Unfortunately, hidden cameras come in such a variety of shapes and sizes and can be so small that finding one is like looking for a needle in a haystack. The one factor that can help you find them is the fact that the lens always has to be visible. Try scanning your environment carefully and look for anything that seems out of place or a little off. Look for a camera lens, whether it be large or small – clock faces are a good place to hide tiny spy cameras, as are smoke detectors, air filter equipment, wall hangings, electrical outlets, tissue boxes and DVD cases. Turn the lights off and look for any lights that remain on that shouldn’t be there, as most hidden spy cameras have a red or green LED light that will turn on or blink in low light. You can also make a phone call and walk around the room as hidden surveillance that is wireless will give off a special radio frequency that may interrupt your call. You can also use a mobile app to find wireless hidden cameras. If these methods don’t turn anything up and you are still suspicious, get a professional detector to sniff out hidden CCTV cameras. This is a great tool to take on vacation if you are staying in an Airbnb and you want to be extra sure the owner isn’t recording you. Generally, manufacturers install a tiny board camera into a generic item. The technology can be much more compact than your standard video recorder or DSLR camera, but the quality of the footage will reflect that. Depending on whether you have a batter or a plug-in camera, the setup will vary, but once it is set up it should just record until it either runs out of space or you retrieve it to review and clear the video. Not only is the answer yes, but anyone with footage of a crime in progress must hand it over to law enforcement. Video footage doesn’t just help catch law-breakers, but it can also help convict them of their crimes. If you don’t alert officers to the existing video and someone finds out, they may even charge you with obstruction of justice. If you are intending on using your hidden camera for security purposes, make sure it is at a good, higher vantage point and has an unobstructed view of the area you are surveilling. For instance, if you are trying to cover your entryway, you may want to place it above the door or on the corner of the garage, so you have a clear view. If the spy camera is visible, try to place it above easy reach so robbers can’t reach up and cover or remove it. Can hidden spy cameras operate in most temperatures? If you are planning on purchasing an outdoor spy camera, you need to make sure it can operate in a range of weather conditions, particularly if you live somewhere with extreme temperatures. Generally, a black and white camera can operate between -10°F and 122°F, while a color camera can operate between -10°F and 104°F. You can generally store the camera between -22°F and 158°F, though generally it is a better idea to store your camera at a more moderate temperature. Also, keep in mind that these temperatures are generally the case but not always the case, so make sure you read your spy camera manual and check it after your first freeze or particularly hot day. Hi !! I’m looking for a mini camera that has a good zoom and good quality, controlled with smartphone.